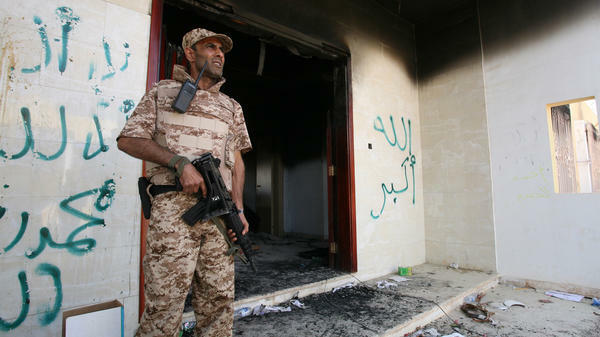 A Libyan military guard stands in front of one of the U.S. Consulate's burnt-out buildings in Benghazi Sept. 14 during the visit of President Mohammed el-Megarif. Wearing the traditional long white robe of men in Libya, Megarif is visibly exhausted when we speak to him at his home in Benghazi. As he describes the ambush on the U.S. consulate that killed Stevens and three other Americans, his eyes water and he drops his head. "Our friend and friend of all Libyans and all residents of Benghazi and we feel very, very, very," deep sadness, he says. A steady stream of people files in and out of the soft-spoken president's home. This eastern Libyan city was the birthplace of the revolt against late dictator Moammar Gadhafi. Now it is a neglected place, with few security forces on the street and a flood of heavy weaponry. Megarif says that over the past few months, foreigners took advantage of the security vacuum and flowed into the country from Mali and Algeria. I ask if this attack was over an anti-Muslim film that sparked violent protests across the Muslim world. He shakes his head. "The idea that this criminal and cowardly act was a spontaneous protest that just spun out of control is completely unfounded and preposterous," he says. "We firmly believe that this was a precalculated, preplanned attack that was carried out specifically to attack the U.S. Consulate." The attackers used the protesters outside the consulate as a cover, he says. "The intention was there from the beginning, for it to take this ugly barbaric, criminal form," he says. Megarif claims evidence shows that some elements of Ansar al-Sharia, an extremist group in eastern Benghazi, were used as tools by foreign citizens with ties to al-Qaida to attack the consulate and threaten Libya's stability. Ansar al-Sharia rejects the democratic process in Libya, and does not recognize the new Libyan government. Only God's law rules, it says. Still, U.S. officials have cast doubt on the theory, saying they see no links between the assault and al-Qaida at large. The spokesman for the U.S. president said Friday there was no evidence the attack was preplanned. Ansar al-Sharia has denied any involvement in the attack. The ambush earlier this week gets at a deeper security problem in Libya: The government has no control over the heavy weaponry that proliferated during the days of the rebellion. There is no functioning justice system, and Megarif says extremist elements have infiltrated the security apparatus. "We are working on an emergency plan and exceptional measures to close those holes," he says. He seems disappointed that an FBI investigative team chose not to come to Libya. The team's trip was reportedly postponed because of the security situation. He hopes the group is still on its way, with more advanced tools to investigate. This is both a domestic and diplomatic crisis for Megarif. The U.S. is a major backer of the new Libyan authority. Stevens was sent as an envoy to Benghazi during the rebellion before becoming ambassador to the new Libya. "We hope that this act, as tragic and sad as it was, will not have an effect on this strong relationship, which will only grow stronger in the future," he says. But finding and bringing the perpetrators to justice remains a challenge. He says about 10 people are in custody but didn't specify if they are Libyan or foreign. "I think that the atmosphere surrounding Libyans, with the exception of this small group, is a sense of disgust towards this incident," he says. "Their spirit shows that they are ready to cooperate with the authorities to put an end to this danger that infiltrated the country." The toll of this crisis is evident on Megarif's face as we speak. He is in damage-control mode and expresses deep sadness and apologizes to the American people. "What is helping ease our grief is what we saw from both the president and the secretary of state: the understanding of the exceptional circumstances that Libya is going through and that this act does not represent the Libyan people nor what they are longing for in the future," he says. Libyans, he says, should no longer feel they are at the mercy of these armed groups. But the reality is that until the government here exerts control, they are. Libya's president says he believes Muslim extremist group al-Qaida is behind this past week's deadly attack in eastern Libya which killed U.S. Ambassador Chris Stevens and three other Americans. U.S. officials say they have no evidence the attack was preplanned. However, in an interview with NPR's Leila Fadel in Benghazi, President Mohamed Megariaf says foreigners infiltrated Libya over the past few months, planned the attack, and then used Libyans to carry it out. LEILA FADEL, BYLINE: Wearing the traditional long white robe of men in Libya, President Mohamed el-Megariaf is visibly exhausted when we speak to him at his home in Benghazi. As he describes the ambush on the U.S. consulate that killed Stevens and three other Americans, his eyes water and he drops his head. FADEL: He finishes in Arabic. We feel deep sadness. FADEL: A steady stream of people file in and out of the soft-spoken president's home. This eastern Libyan city was the birthplace of the revolt against late dictator Moammar Gadhafi. Now it is a neglected place, with few security forces on the street and a flood of heavy weaponry. FADEL: Megariaf says that over the past few months, foreigners took advantage of the security vacuum and flowed into the country from Mali and Algeria. I ask if this attack was over an anti-Muslim film that sparked violent protests across the Muslim world. He shakes his head. EL-MEGARIAF: (Through Translator) The idea that this criminal and cowardly act was a spontaneous protest that just spun out of control, is completely unfounded and preposterous. We firmly believe that this was a pre-calculated, preplanned attack that was carried out specifically to attack the U.S. consulate. FADEL: The attackers used the protesters outside the consulate as a cover, he says. EL-MEGARIAF: (Through Translator) The intention was there from the beginning, for it to take this ugly barbaric, criminal form. FADEL: He claims evidence shows that some elements of an extremist group in eastern Benghazi, Ansar al-Sharia, were used as tools by foreign citizens with ties to al-Qaida, to attack the consulate and threaten the stability of Libya. Ansar al-Sharia rejects the democratic process here and does not recognize the new Libyan government. Only God's law rules, it says. Still, U.S. officials have cast doubt on the theory, saying they see no links between the assault and al-Qaida at large. Ansar al-Sharia has denied any involvement in the attack. The ambush earlier this week gets at a deeper security problem in Libya. The government has no control over the heavy weaponry that proliferated here during the days of the rebellion. There is no functioning justice system and Megariaf says extremist elements have infiltrated the security apparatus. EL-MEGARIAF: (Through Translator) We are working on an emergency plan and exceptional measures to close those holes. FADEL: For Megariaf this is both a domestic and diplomatic crisis. The United States is a major backer of the new Libyan authority. Stevens was sent as an envoy to Benghazi during the rebellion, before becoming ambassador to the new Libya. EL-MEGARIAF: (Through Translator) We hope that this act, as tragic and sad as it was, will not have an effect on this strong relationship, which will only grow stronger in the future. FADEL: But finding and bringing the perpetrators to justice remains a challenge. He says about 10 people are in custody but didn't specify if they are Libyan or foreign. EL-MEGARIAF: (Through Translator) I think that the atmosphere surrounding Libyans, with the exception of this small group, is a sense of disgust towards this incident. Their spirit shows that they are ready to cooperate with the authorities to put an end to this danger that infiltrated the country. FADEL: The toll of this crisis is evident on Megariaf's face, as we speak. He is in damage control mode and expresses deep sadness and apologizes to the American people. EL-MEGARIAF: (Through Translator) What is helping ease our grief is what we saw from both the president and the secretary of state; the understanding of the exceptional circumstances that Libya is going through and that this act does not represent the Libyan people, nor what they are longing for in the future. FADEL: Libyans, he says, should no longer feel they are at the mercy of these armed groups. But the reality is that until the government here exerts control, they are. Leila Fadel, NPR News, Benghazi. Transcript provided by NPR, Copyright NPR.